Indigenous Architecture is Not Object Orientated. 2018 is a historical year for Canada in Venice. 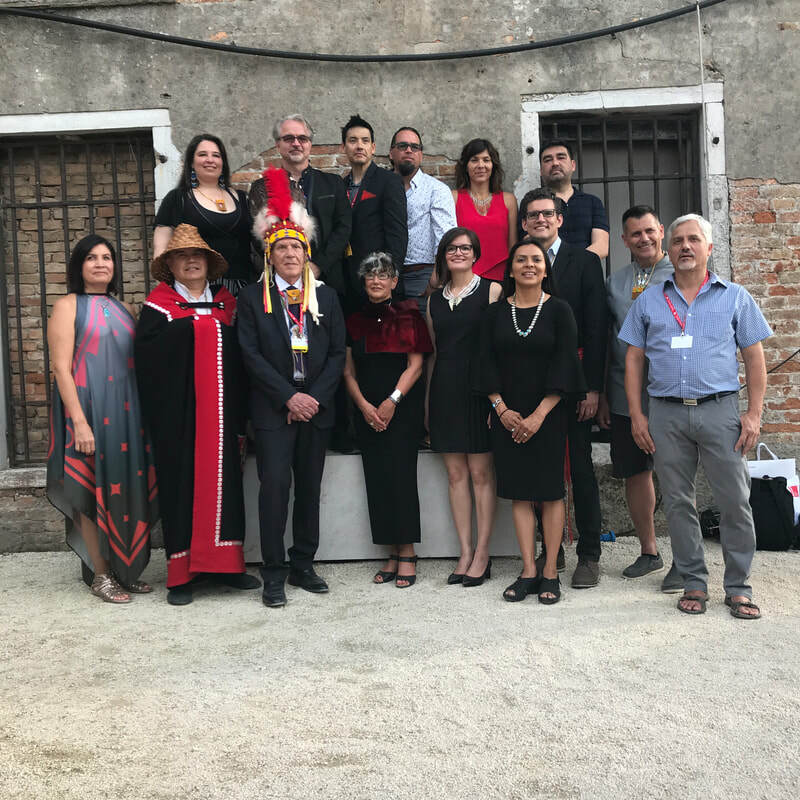 The renovations to the Canadian Pavilion in the Giardini della Biennale are completed, and the pavilion was ceremonially reopened to the public at the launch of the Biennale. After almost sixty years, the pavilion required restoration. Since it was unavailable during the time needed to prepare this year’s entry to the Architecture Biennale, the Canadian exhibition is installed at the Arsenale. More importantly, the 2018 Canadian entry stands out as it is the first time Canada has selected Indigenous architects to represent it. For this installation, developed by a large team of Indigenous architects and titled UNCEDED: Voices of the Land, Douglas Cardinal (Blackfoot) served as lead architect/presenter; he was supported in this role by curators Dr. David Fortin (Métis) and Dr. Gerald McMaster (Blackfoot and Cree). What most don’t understand is that Canada, to this day, is a colonial project, one that functions as a complex set of relationships to its sovereign Indigenous peoples and their natural resources. The exhibition seeks to help rectify this lack of awareness. A spirit of generosity envelops the architectural team representing Turtle Island (the place name for what settlers refer to as North America). With twenty honorary PhDs, Douglas Cardinal is internationally respected for his conceptual and formal contributions to architecture; his accomplishments could have easily been showcased independently at the Biennale, but this occasion was to be shared, a decision that illustrates solidarity among Indigenous architects. That this entry represents Indigenous architects from what most consider today to be Canada and the US (Turtle Island) is a political statement in itself. Indigenous relations on Turtle Island do not treat borders in the same manner as the aforementioned governing entitles. Alongside Douglas Cardinal, the sixteen other architects showcased are: Tamarah Begay (Navajo), Harriet Burdett-Moulton (Metis), Jake Chakasim (Cree), Chris Cornelius (Oneida), Wanda Dalla Costa (Cree), Tammy Eagle Bull (Lakota), Ryan Gorrie (Anishinaabe), Daniel Glenn (Crow), Ray Gosselin (Dakota, Metis, and German), Matthew Hickey (Mohawk), Brian Porter (Oneida), Ouri Scott (Dene), Eladia Smoke (Anishinaabe), Patrick Stewart (Nisga’a), David Thomas (Anishinaabe), and Alfred Waugh (Dene). The installation is everything one would expect from Douglas Cardinal. Spatially, in signature style, its flow undulates through time as the wind-sculpted land or sweeps like an ancient sleeping river. At the entrance, a video of Kitigan Zibi Elder Jane Chartrand welcomes us. She represents the Grandmothers Council and speaks from this responsibility, noting that “Elders must advise gently, to encourage us to come with a clear heart and clear mind in connection to the land.” Chartrand acknowledges the natural elements and welcomes us to this space in a good way. It is a grounding initiation into the installation, a gesture related to a “Welcome to Territory,” yet it is respectful of the fact that we are visitors on Italian soil. After this welcome, the installation meanders into four main spaces. It is rich in media. There is extensive content projected on multiple screens throughout. Everything has intention and purpose. The curating needed to respect the numerous lives, cultures, and architectural practices represented in the exhibition. In the first space, audiences are introduced to Dr. Douglas Cardinal and some of his prolific practice. The spaces undulate, and, in the alcoves, media projections with targeted audio speakers relay culturally imbued personal narratives. Sometimes it is hard to hear the content, yet there are specific spaces in each area where the sound is intended to be absorbed intimately. One of the media screens portrays the community consultation for the First Nations University of Canada project in Regina, Saskatchewan. The consultation process had a profound influence in the final design of the university, as the local Elders offered a compelling vision, with the desire to have a central sacred space for them to hold ceremony, receive students, and welcome the community. The iconic mîkiwahp (tipi) was integrated into the schematics, reinforcing this sacred space’s cultural significance, and the result was an internationally recognizable façade for the university. As audiences proceed deeper into UNCEDED, they are introduced to the other architects and encounter historical references to the impacts of colonization on the Indigenous Peoples of Turtle Island. Profound facts are relayed through media about colonization and the Catholic Church. For instance, visitors learn that, in 1491, “ten million Indigenous Peoples lived on Turtle Island”; and in 1493, “the Pope of Rome issued the Papal Bull, declaring ‘savages have no souls, you may kill them.’” Then, from 1492 to 1900, “nine million Indigenous People died due to foreign diseases and violent colonial conflict.” These statements seem emotionally heightened by the fact that we are in Italy. The installation continues to meander gently and finishes in an abstracted ceremonial circular room, where a bench encourages contemplation, so that audiences can reflect upon the final media screens. The audio that echoes through the space hits tender emotional cords and reinforces a fully sensorial experience. It is powerful to hear the voices of our First Peoples tell their own stories, to hear sacred songs sung, and to hear the drum beat, which conjures muscle memories of dance. The context is paramount in this distant land, this Western Mecca where high art is esteemed, and where the international stage is set for creative work that will be hosted by and concurrently attract the world’s intellectual elite. What is the Indigenous relationship to, or intention behind, presenting at the Venice Biennale? This has been an ongoing conversation within the Indigenous art community for decades. “Venice, Love it or Leave it?” was a panel discussion organized and moderated by Ryan Rice for the 2007 Aboriginal Curatorial Collective Colloquium hosted in Saskatoon by Tribe Inc., a center for evolving Aboriginal media, visual and performing arts. The panel asked: “Is the world’s stage a place for Aboriginal artists and curators to strive for? In the end, does it make a difference and what are the effects of representing?” The conversation resulted in a heady discussion with those who had previously participated on this global platform. Dr. Gerald McMaster had the honor of curating an installation created by Edward Poitras, the very first Indigenous artist to represent Canada at the Venice Biennale of Contemporary Art in 1995. What was paramount to the panel was a statement made by McMaster, in which he emphasized that one’s politics do not matter on the international stage: the work has to be provocative and formally resolved, the work has to be strong to stand out. McMaster recognizes that much has advanced since 1995, and the motivation to continue to participate is valid. At the 1995 Venice Biennale, there was no felt Indigenous audience; our participation in the global conversation was just beginning, and the media response to Edward Potrias’ project was insufficient. Since that time, we have seen many Indigenous curatorial delegations tour various international biennales, and there is an increased representation of Indigenous artists in these critical, mass exhibitions. A few privileged Indigenous artists, curators, and architects are now recognized, and, as a result, our politics or stories are advancing as well. However, we still have a long way to go. There is still support and action required for our Indigenous creative intellectuals, who need increased representation in all spaces of the field—in the gallery streams, as well as in influential senior positions in major art and design institutions—to reflect our critical role and relationship to this land and our political sovereignty. When considering the development of the curatorial process for the 2018 Venice Project, the notion of UNCEDED remained central from the beginning, as McMaster has emphasized. The architects on the team gathered and considered entry points in Indigenous contemporary architecture. Everyone on the team holds great respect for and honors Douglas Cardinal, who effortlessly facilitated the initial conversation at OCAD University. The discussion began with a response to the industrial, residential, and boarding-school scenarios on Turtle Island, which unfortunately still systemically affect our cultures in dramatic ways. Native American people still feel the impacts of attempts to assimilate and institutionalize them. It is impossible to deny the affects of colonization when we consider our design histories. The interactions with the Crown have challenged Indigenous people socially and politically, and affected our economies, our relations to other living creatures, our languages, and our traditional territories—yet we have not given up on our core values, we hold on to our sovereignty. This response to institutional structures is what motivated UNCEDED. This leads us to reflect and project onto the bigger picture. Four major themes grounded the development of the project: the impacts of colonization; resilience, which has supported Indigenous Peoples overcoming the overwhelming odds in favour of assimilation; sovereignty, which provides the grounds to hold onto our ancestral land and ways of being; and Indigeneity, which supports our destinies through cultural continuity and fuels Indigenous Futurisms. Ultimately, the process was determined by the outcomes that highlight Indigenous values, which take into consideration our community, the Indigenous story, our territories, and how we navigate our current context. The exhibition is about language, history, and ceremony, which were articulated through a new set of design principles that are outlined on a didactic panel as you enter the installation. Co-curator and architect David Fortin adds that Indigenous architecture is not object orientated, but that structure manifests through our ancestral experiences and accumulated knowledge systems. Inspired by these notions, UNCEDED aims to support the story of relationships, to offer insights into the paradigms of Turtle Islands First Peoples in relation to the land, the natural elements, and all our relations. Everything interconnects, creates, or constructs space: our intentions, the sounds, the gestures, and our time-collapsing connections and commitments to sustaining our relationships, which in turn inform our complex Indigenous worldviews. There is a continuum, and the underpinning or framework of Indigenous culture is the architecture itself. Jason Baerg (Métis) is a visual artist and Assistant Professor in the Faculty of Art at OCAD University.